Snap(shot) Judgements are posts that will appear with no real regularity. It’s primarily a way for us to get thoughts and photos up as soon as possible, especially when we have no plan to write a feature-length column on the subject. 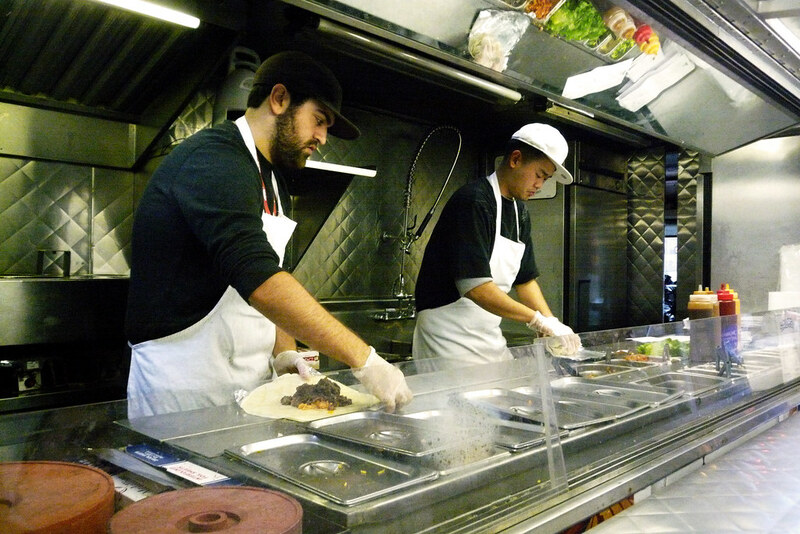 Here, Gary samples the fare at Korilla, a Korean-Mexican food truck. Can I just say it’s about damned time we finally got an Asian-influenced Mexican food truck? Los Angeles has a kajillion Kogi trucks and we’re just now getting our own version in the form of Korilla? (By the way, if there’s another one out there that’s been around longer than these guys, I apologize!) The first time I tried their tacos, it was when they showed up at the Eater Awards, after I’d gobbled down plenty of food, not to mention putting away a few drinks – not the best way to really get a sense of what their food was like. Since then, I’ve been here twice, once for the bulgogi tacos and the other for the pulled pork burrito. Both times have been excellent. In the end, it comes down to the flavor combinations here – whether it be the bacon and kimchi fried rice, the meats themselves, or, more importantly, the sauces, they’re all done really well.